ISBN codes are used on all books published worldwide. It’s a very powerful and useful code, because it has been designed so that if you enter the wrong ISBN code the computer will immediately know – so that you don’t end up with the wrong book. There is lots of information stored in this number. The first numbers tell you which country published it, the next the identity of the publisher, then the book reference. Look at the 10 digit ISBN number. The first digit is 1 so do 1×1. The second digit is 9 so do 2×9. The third digit is 3 so do 3×3. We do this all the way until 10×3. We then add all the totals together. If we have a proper ISBN number then we can divide this final number by 11. If we have made a mistake we can’t. This is a very important branch of coding called error detection and error correction. We can use it to still interpret codes even if there have been errors made. If we do this for the barcode above we should get 286. 286/11 = 26 so we have a genuine barcode. Challenge (harder!) 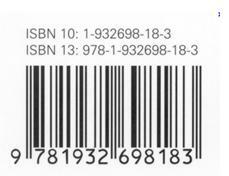 :The following ISBN code has a number missing, what is it? Answers in white text at the bottom, highlight to reveal! 1) 3 – using x as the missing number we end up with 5x + 7 = 0 mod 11. So 5x = 4 mod 11. When x = 3 this is solved.